People who brush their teeth with an electric toothbrush have been shown to have whiter teeth, less plaque, and healthier gums. Even though the most expensive models can cost over $200, we feel they are worth the price because of the results they get. Electric toothbrushes operate through either sonic technology, used in Philips Sonicare models, or rotating-oscillating brush heads, as used in most Oral-B products. The sonic function vibrates the bristles at high frequency and sweeps along the gum line. The rotary function uses a motor to oscillate the brushhead in a circular motion and can get to hard to reach areas. One isn’t necessarily better than the other, it really comes down to user preference. If you are going to buy an electric toothbrush, at the very least you should get a model with a two-minute timer. A 30 second quadrant timer is another important feature so you can spend the same amount of time on each quadrant of your mouth. Many new versions now include Bluetooth connectivity to an app you use with your phone and other smart features. Some people might really like these features while others will find them completely unnecessary, especially since they cost more. In addition to initial cost, you should see how much replacement brush heads cost, because they need to be replaced about every 3 months. Plus there are several different types for both Phillips and Oral-B models. Other things to look for include how it charges and how long the battery life is, different cleaning modes or intensities, a pressure sensor, and if it includes a travel case. Below we review the best electric toothbrushes. At the bottom of this article we have an electric toothbrush comparison chart of all the top models to compare one versus another easily. We selected the $99.99 Phillips Sonicare ProtectiveClean 6100 as the best electric toothbrush. This thing has three modes – clean mode, white mode, and gum care mode – and three different intensities to clean teeth and remove stains which will result in whiter teeth. It also uses Phillips’ BrushSync technology which both matches your brush head to the optimal mode and intensity and tracks how long you have been using your brush head and reminds you when it needs replaced. Other features of the ProtectiveClean 6100 include a two-minute timer, quadrant pacer timer, pressure sensor, compact charging base, and travel case. The battery will last about 14 days on a single charge. It comes with one W Diamond Clean brush head which is designed to help whiten teeth, while it is also compatible with any Phillips brush heads. Overall the Phillips Sonicare ProtectiveClean 6100 is a great choice for anyone who wants some different cleaning modes and intensities, but has no need for any smart features or apps. The $99.94 Oral-B Pro 6000 SmartSeries came in tied for first in our ratings. This one actually had the highest rating for electric toothbrushes on Amazon at 4.5 stars, but which one is best really depends on which brush action you prefer – the sonic vibrations of Phillips Sonicare or the oscillating/pulsing action of the Oral-B model. The 6000 SmartSeries has 5 modes – Daily Clean, Gum Care, Sensitive, Whitening, and Pro-Clean Mode – which is great for any oral care need. Other features of the Oral-B Pro 6000 SmartSeries include a two-minute timer, 30 second quad timer, lit pressure sensor, travel case, and 14 day battery life. It comes with one CrossAction brush head, but is compatible with all Oral-B brush heads. It also has Bluetooth for use with the free Oral-B app to track your brushing. Overall the Oral-B Pro 6000 SmartSeries makes a great choice for an electric toothbrush under $100. One step down from the ProtectiveClean 6100 is the $70 Phillips Sonicare ProtectiveClean 5100 Gum Care. This model has 3 modes, but no intensity settings. It also has the BrushSync replacement reminder, but no mode-pairing. The 5100 is designed for healthier gums and comes with one Optimal Gum Care brush head. Other features of the ProtectiveClean 5100 include two-minute timer with quad pacer, pressure sensor, travel case, two week battery life, and an easy-start feature which slowly increases the power of the brush each day as you get used to the Sonicare experience. 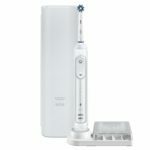 The Phillips Sonicare ProtectiveClean 5100 Gum Care is a great choice for anyone who does not need smart features, apps, or any intensity adjustments, but does want some different modes – especially for gum care. The second most expensive electric toothbrush in Oral-B’s lineup is the $150 Oral-B Genius 8000. This thing has more smart features than other Oral-B models which drives the cost up. The primary feature is the enhanced Position Detection within the Oral-B smartphone app. This feature uses innovative technology and your device’s camera to help ensure you never miss a zone. However, many people find it is inaccurate and feel it is not worth the money. Other features of the Oral-B Genius 8000 include 6 modes, two-minute timer with 30 second intervals, visible pressure sensor, 12 day battery life, and a travel case that charges both your toothbrush and phone. It comes with 1 CrossAction, 1 3D White, 1 Sensitive Clean brush heads. You really only should buy the Oral-B Genius 8000 if you will use the smart features it comes with. However, if you won’t use them you can save some money by considering the Pro 7000 or any other option under $100. 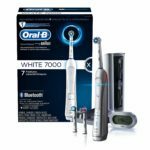 Another solid option is the Oral-B Pro 7000 SmartSeries which costs about $120. The 7000 SmartSeries, like other Oral-B models, operates by oscillating, rotating, and pulsating to break up and remove plaque. It has 6 modes including a unique tongue cleaner mode and is compatible with all Oral-B brush heads. It also comes with 1 CrossAction brush head, a visible pressure sensor, timer, travel case, and Bluetooth communication between brush and smartphone. 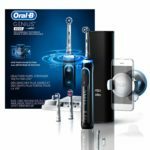 It does not have the Position Detection of the Genius 8000, buy you can still download the Oral-B app for your phone to provide you with real-time feedback focusing on brushing your most important areas, tracking your habits over time, and sensing when you brush too hard. Some people might like using the app which can help keep you motivated and brushing the right way, however, for others it will be pointless. You do not need to use the app to use this toothbrush – many people have said they use it without it. Overall we really like the cleaning ability of the Oral-B Pro 7000 SmartSeries, although a few people have complained about bright lights on the unit and not a lot of runtime on a single charge. The Bluetooth and app interface is a bit gimmicky and like we said some will love it and some will find it useless. For those that don’t care about the app, a premium travel case, or the tongue cleaning mode you could save some money and get the Oral-B SmartSeries 5000 instead. 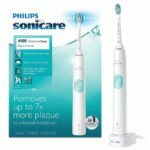 Phillips’ most expensive and premium electric toothbrush is the Philips Sonicare 9700 DiamondClean Smart which costs around $260. Phillips claims it will remove 10x more plaque, improve gum health 7x in just two weeks, and remove 100% more stains in just 3 days versus using a manual toothbrush. It has 5 modes – Clean, White+, Deep Clean+, Gum Health, and Tongue Care – along with 3 different intensities. The DiamondClean Smart also uses Bluetooth and the Sonicare app to track your brushing and receive coaching. Other features include two-minute timer with 30 second quad pacer, pressure sensor, USB charging travel case. To charge this model just place it in the included glass for up to 14 days of battery life. The Philips Sonicare 9700 DiamondClean Smart comes with 8 different brush heads including 3 Premium Plaque Control, 2 Premium Gum Care, 2 Premium White, and 1 TongueCare+ tongue brush. 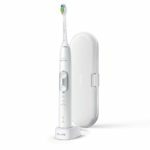 There is also the Philips Sonicare 9500 DiamondClean Smart which is the same electric toothbrush, but comes with fewer brush heads for a price of $230. One step down from the Pro 6000 is the $90 Oral-B Pro 5000 SmartSeries. They are very similar, with the main difference being in the design of the actual handle of the toothbrush and a slight performance difference. This model does not have the LED ring with the pressure sensor light, instead it uses a different visible pressure sensor. Features of the Pro 5000 include a two-minute timer with 30 second intervals, 5 modes, travel case, and Bluetooth app connectivity. One other noticeable difference is the batteries which are NiMH instead of the preferred Li-Ion. This means your batteries will not last as long and you get at most 11 days of life. It also includes 1 Floss Action brush head. Overall we think it is worth the extra $10 to go with the Pro 6000 SmartSeries over the Oral-B Pro 5000 SmartSeries. Maybe the best cheap electric toothbrush is the $40 Phillips Sonicare ProtectiveClean 4100. With this model there are no special gimmicks, just 1 mode that gets the job done. It comes with 1 Optimal Plaque Control brush head. Other features include a two-minute timer with 30 second quadpacer, a pressure sensor, and 14 day battery life. There are no smart features or additional intensities. It also comes with a charger, but no travel case. For most people this is a perfect electric toothbrush that is cheap and gets the job done. You should buy it if prefer the sonic action over the rotating action and you don’t need smart functions or additional modes. 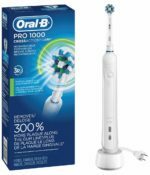 Another quality cheap electric toothbrush with a price of about $40 is the Oral-B Pro 1000. Its simplicity and low cost make it the number one best selling electric toothbrush on Amazon. With just one cleaning mode it lacks the different cleaning settings of the more expensive models, but it still does a good job cleaning teeth, especially the hard-to-reach ones. It also has a pressure sensor to let you know if you are brushing too hard and a timer that pulses every 30 seconds. 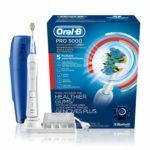 We recommend the Oral-B Pro 1000 for anyone who wants the cheapest electric toothbrush they can buy that still is good enough to get results. If you prefer the sonic action then you should consider the Phillips Sonicare ProtectiveClean 4100, however. 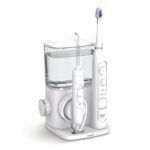 The toothbrush included in the $109 Waterpik Complete Care 9.0 Sonic Electric Toothbrush + Water Flosser won’t wow you, but when combined with the water flosser you get an amazingly efficient bargain. The entire kit includes the electric toothbrush, water flosser, water reservoir, toothbrush travel case, 2 Classic Jet tips, 1 Plaque Seeker tip, 1 Orthodontic tip, 1 Pik Pocket tip, and 2 Triple Sonic brush heads. Now the electric toothbrush is just a basic ‘sonic’ toothbrush with 3 modes. It isn’t great, but works decent enough. You can get a 3-pack of replacement brush heads for about $17. The one main negative we saw from users is that the battery does not last very long. However, you can buy just the electric toothbrush separatly if needed. Overall we especially recommend the Waterpik Complete Care 9.0 for those of you who have gingivitis, who want healthier gums, or who wear braces. The waterpik floss-like action cleans between teeth, around braces, and around the gum-line better that an electric or manual toothbrush alone.